Fitzgerald was right when he said authors were bound to repeat a limited number of stories in various guises. This Hemingway collection, for example, contains fragments of what eventually became A Farewell to Arms—especially in “A Very Short Story” and “In Another Country” (and the latter title was one he considered for the novel itself). There are also pieces of what would become Green Hills of Africa, For Whom the Bell Tolls and The Old Man and The Sea. But there is none of the tedium of Fitzgerald’s repetition here—each variant in Hemingway is a different revelation, a new discovery of both literary and archeological fascination. It’s like walking in Jackson Pollock’s studio and recognizing the edges of great paintings on the floor. By the time Hemingway wrote the latest story in this collection, in 1938, he had lived in, loved and come to know Paris, Milan, Madrid, Montreux (in Switzerland), Havana, Toronto and other places. He spoke French, Italian and Spanish; his German was decent. He learned enough Swahili to communicate with his guides and trackers when he hunted in Africa. Each of his experiences became a novel, but, before they did, they were stories. And many of the stories are as good or better. “The Short Happy Life of Francis Macomber,” is the first story in the collection and also the best and finest short story I’ve ever read. Hemingway’s psychological acuity is on par with Fitzgerald’s, but manifests itself in the opposite way: In Fitzgerald, the woman always wins. In Hemingway, the man always wins—even if he has to die to do it. “Macomber” is precisely that: The triumph of the man, even in death, is what gives the story its remarkable charge. Fitzgerald was liable to be sentimental, if he wasn’t on his guard. Hemingway hated sentimentality—he wanted to scorch, shoot, punch, stab and blast sentimentality to smithereens. His characters are less likely to feel sorry for themselves, and more likely to get down to business, no matter how ill-prepared they are: They pull things together, or they go down, but they don’t give up. “Fifty Grand,” a boxing story, is another exceptional masterpiece and a particular example. Plenty has been written attacking Hemingway’s macho philosophy. Hemingway may not have been as good as his heroes, but it’s silly to think that he would be. He sometimes overdoes it. (And he uses far too many conjunctions and not enough commas.) More often than not, he’s exactly on the mark and wastes no time getting there. In an age where our high school English teachers tell their young men that it’s actually ok for them to cry, Hemingway helpfully reminds us that, no, it isn’t. 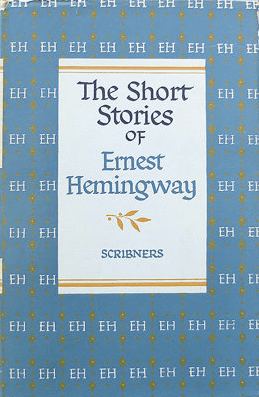 The Short Stories of Ernest Hemingway. Scribners, 1953. 499 pages.